I’m not sure if I’ve lost more waking hours or sleeping hours toTetris, but it’s a depressing number of each. A person can’t just casually play Tetris. A distant cousin of games like dominos andBreakout, at its slowest levels Tetris a perfectly simple game of creating lines for points. At its highest speeds, Tetris is demonic and taunting, and if you’re not ready for the next speed boost you won’t last long. At its highest speeds, one simple mistake – one flick of the thumb too much, or not enough – and you’re done for. This trick, that it’s such an easy game, is where the obsession hides, deep in the coding. It should be as simple as counting to four with your thumbs. But when it comes to Tetris, the thumbs are incompetent slaves to the brain, and the brain is an incompetent slave to the will. Like most classic arcade games, it doesn’t have an ending, it just gets harder until you die. But in the 1990s there was no one better at Tetris than a strange skinny kid from Texas named Thor Aackerlund. No one came closer to “beating” Tetris than he did. His thumbs actually were slaves to his brain, vibrating the d-pad more than pushing it, creating an incredible speed for sliding pieces left and right. Watching him play is a hard thing to reconcile with reality, that’s how agile his piece movement is. Aackerlund, who finished in first place at the Nintendo World Championships in 1990, is the closest thing the game of Tetris has ever had to a grand champion. But then he fell off the map. 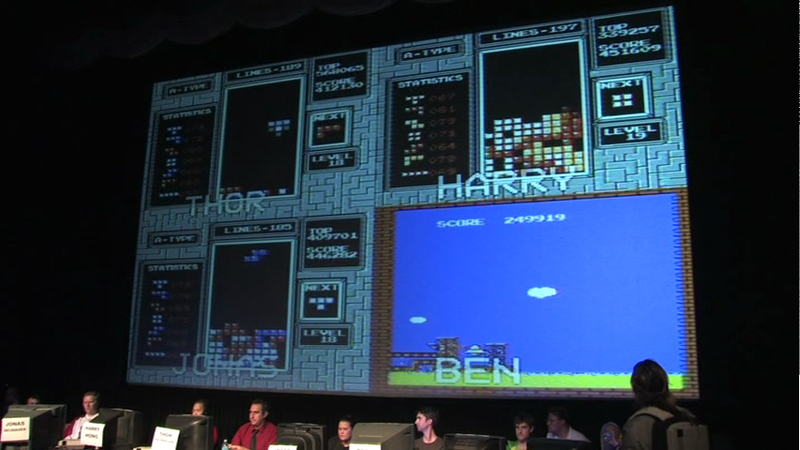 In 2010, one of his competitors at the NWCs, Robin Mihara, set out to fix the record when it came to Tetris, calling together the country’s best players – as verified by the Twin Galaxies score board – for a winner take all tournament in Los Angeles. Unlike King of Kong or Chasing Ghosts, Ecstasy of Order doesn’t seek to find Aackerlund to mine his story for narrative gold. Though he seems to be something of a tragic figure in the small segments that do trace the broadstokes of his story, Adam Cornelius’ documentary is as obsessed with the game as its devoted fans are. It only seeks Aackerlund out because you cannot have a championship of Tetris without the man once regarded as the best. Perhaps that’s a tragic flaw for the film. Perhaps Aackerlund’s life could have been mined and made for a better film, like Steve Weibe’s, but perhaps it’s also better this way. King of Kong was manipulated in ways that made for a great film, but for lousy reportage and I’ve always felt let down by that. Ecstasy of Order maintains its appeal in a more pure fashion: the viewer’s ownTetris demons. The tournament collects the best players in the world – Jonas Neubauer andHarry Hong, who have maxed out the high scores (999,999), and Ben Mullen, who held the record for high lines (296 – my own personal high is a paltry 191) – and shows their triumphs and failures in terms of the game itself. The best players in the world can be stumped by a longbar drought just like the rest of us. The best players in the world can drop a piece in the wrong place just like the rest of us. It keeps the allure of the game’s difficult simplicity alive as it asks the most tantalizing question: is there even a such thing as a Tetris Master? 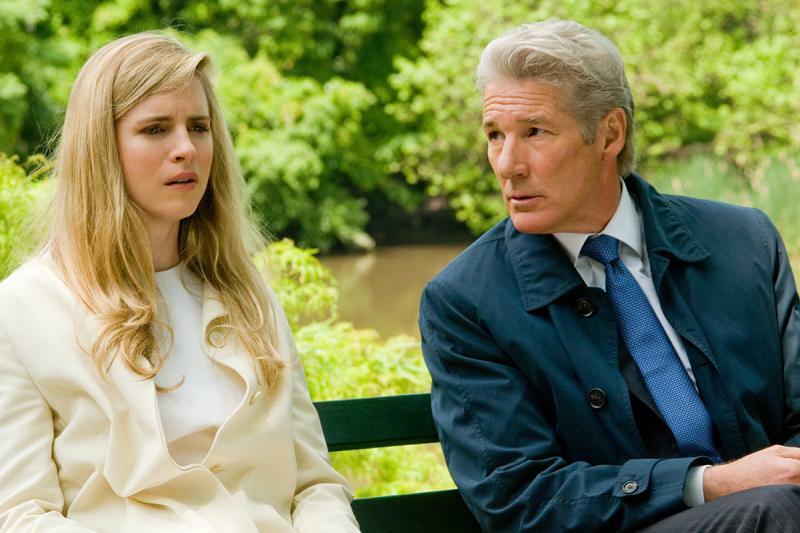 Nicolas Jarecki’s Arbitrage is not necessarily a bad movie; it just doesn’t seem to have much of a purpose or a point, and that’s troubling. If it’s a thriller, it’s not thrilling enough. If it’s about a modern god being destroyed by his flaws and indiscretions, then they simply do not run deep enough. The god of the piece, billionaire fund manager Robert Miller (Richard Gere), has it good, but never seems to quite have the world by the balls like his real and fictional counterparts usually do. He has the jet and the townhouse, the lackeys (Chris Eigeman) and lawyers (Stuart Margolin), and the woman on the side, Julie (Laetitia Casta). But there is something missing. It seems he’s missing an edge – in his dramatic aura, there is a lesser order of danger and guile. Still, Miller makes it work, building his fortune, funding his wife Ellen’s (Susan Sarandon) philanthropy mission and bringing his daughter Brooke (Brit Marling) along in the family business. The financial crisis has left him seemingly unscathed, or that’s what he tries to sell with his image. In truth, his fund is $400 million in the hole and he’s trying to sell as fast as possible before anyone notices. It’s complicated all the more when, driving upstate in the middle of the night with Julie, he dozes off and flips the car over, killing her. In that moment, he sees his world fall apart, scorched to ash by the licking flames of the burning car. Like any other rich, powerful man who wrecks his car while a girl he shouldn’t be with is his passenger, he runs. In his running, we don’t even get running – we get cautious evasion. There is no psychological component to the film, just guilt and money. Jarecki is content to skip along the film’s surface, rending drama out of the legal trouble Miller causes for Jimmy (Nate Parker), the kid who picked him up that night. Jimmy is grilled at every turn by the overzealous Detective Bryer (Tim Roth) who wants nothing more than to nail a rich crook to the wall. It feels like Gere’s involvement, like Robert Redford or Warren Beatty, sort of precludes the character from being too bad a guy. He’s bad, but there are extenuating circumstances, so he’s not really that bad. He may have done these horrible things, but deep down he’s a nice guy. Holding Robert Miller up to the likes of Gordon Gekko (Michael Douglas in Wall Street) or Judah Rosenthal (Martin Landau in Crimes and Misdemeanors), we find that very little ends up being at stake. $400 million is a sizable crater in someone’s personal economy, no doubt, but then I think back to an interview with Ivanka Trump from Jamie Johnson’s Born Rich, where her father points to a homeless man and tells her, “He’s worth $2 billion more than me right now.” Miller, on the other hand, never reaches the edge of the map in terms of his woes or triumphs. He simply evades and bargains. It’s tough to say what audiences are supposed to do with that.